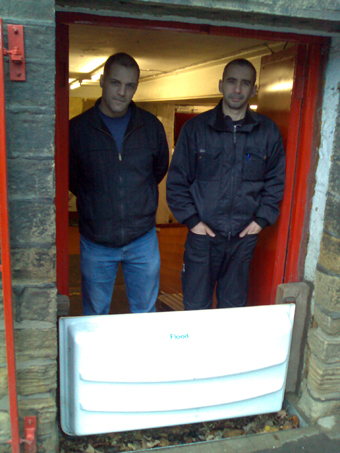 The flood guard that you fitted to the entrance of our premises was tested for the first time during flash floods on 14 September 2006. I can inform you that it worked successfully protecting our property, causing no damage. When the rains started I prepared myself for the worst and had the flood guard in place ready to be fitted if it persisted. As the rain became torrential I noticed the sewer grates starting to bubble so I installed the flood guard immediately which took me approximately 20 seconds and within another 10 seconds the sewer had burst sending an 8 inch deep torrent of sewer water gushing down the main street. I can now sleep soundly at night knowing that my premises are protected by the flood guards defence system.